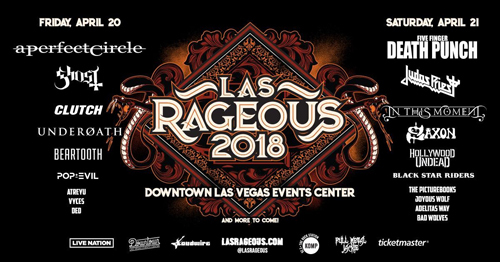 After a successful debut in 2017, which drew rock and metal fans from around the world with sellout crowds of 10,000 each day, Las Rageous returns for its second year on Friday, April 20 and Saturday, April 21. The two-day music festival created by Live Nation will take over two square blocks, in the heart of iconic downtown Las Vegas at the Downtown Las Vegas Events Center, and will feature performances from A PERFECT CIRCLE, FIVE FINGER DEATH PUNCH, GHOST, JUDAS PRIEST, and more, on two stages. A Perfect Circle, Ghost, Clutch, Underoath, Beartooth, Pop Evil, Atreyu, VYCES, and DED, with more to come. Five Finger Death Punch, Judas Priest, In This Moment, Saxon, Hollywood Undead, Black Star Riders, The Picturebooks, Joyous Wolf, Adelitas Way, and Bad Wolves, with more to come. Festivalgoers can expect to hear fan favorites and possibly new music from Sin City mainstay and Saturday night headliner FIVE FINGER DEATH PUNCH, who just released their greatest hits album, A Decade Of Destruction, on December 1. A PERFECT CIRCLE—featuring Billy Howerdel, Maynard James Keenan, James Iha, Jeff Friedl, Matt McJunkins—headline Friday night with an eclectic set that may include their new single, “The Doomed”, their first new song since 2013, which will appear on their upcoming 2018 album. The diverse music lineup ranges from NWOBHM legends JUDAS PRIEST and SAXON, to the spectacle of GHOST and IN THIS MOMENT, metalcore heavyweights UNDEROATH, ATREYU, and BEARTOOTH, up and coming blues-rockers JOYOUS WOLF and THE PICTUREBOOKS, and more. Early bird tickets will be available starting on Wednesday, December 6 at 10:00 a.m. PT, for those who purchased tickets to last year’s event. Unique codes will be provided from Ticketmaster via email this Tuesday. Presale tickets will be available Thursday, December 7 from 10:00 a.m. to 10:00 p.m. PT. Presale passwords can be obtained by signing up for the Las Rageous email list at http://www.LasRageous.com, or from radio partner KOMP-FM. General tickets will be available to the public starting on Friday, December 8 at 10:00 a.m. PT. All tickets available for purchase are 2-day festival tickets for both Friday and Saturday. An initial allotment of two day festival tickets will be available for $119 each, for a limited time only. Fans are encouraged to purchase their tickets early, as the specially-priced $119 tickets are expected to sell out quickly. VIP tickets are also available and include private viewing from a platform and onsite parking. The official Las Rageous video announcement can be found below. https://www.youtube.com/watch?v=Do_g3M2fbT0 Las Rageous is produced by Live Nation Las Vegas.